"If a girl jumps into a briar bush, it is hard to tell which bush scratches the hardest." This birth certificate took my breath away. 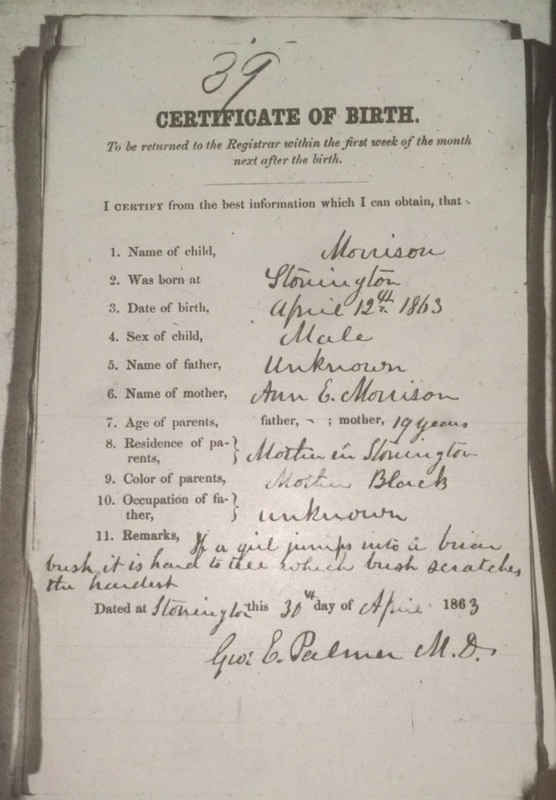 There were several illegitimate births each year in Stonington, Connecticut, but for this one, either the doctor or the clerk felt the need to pass moral judgement on the mother of this baby boy. Yes. It takes more time to look at every page or image. I spent eight hours going through this microfilm reel! That's three days spent at the Family History Center in Exeter, New Hampshire. 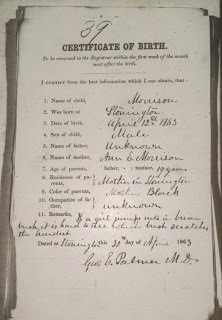 However, not only did I find several family records, I found baby Morrison's birth certificate. Baby Morrison's certificate tells us about the morals of the day and society's view on illegitimate births, promiscuity and racial prejudice. Was this remark made by the white doctor because of the mother's color? We could answer this question by making a survey of all of the illegitimate births in Stonington and noting the doctors' names and their remarks. I hope you will consider going page by page the next time you are hunting for an ancestor's record. Let me know what you find. Stonington, Connecticut, Records of births, marriages, deaths 1847- 1869, Certificate of Birth, 39, Morrison, April 12th, 1863; FHL microfilm 1309873, Item 4. 1850 U.S. census, Stonington, New London County, Connecticut, population schedule, p. 270 (stamped), dwelling 208, family 381, Geo. E. Palmer; digital image, Ancestry.com (http://www.ancestry.com : accessed 19 June 2015); citing National Archives microfilm publication M432, roll 48. 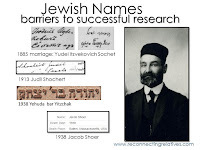 Head over to the Reconnecting Relatives Jewish genealogy blog for help finding your Jewish ancestors. Every Tuesday there will be a new post with tips and resources. The Name Game helps make sense of Jewish forenames and surnames. Learn the answer to the question: Do Yudil, Judil, Yehuda and Jacob all refer to the same man? In the United States in the late 1800s and early 1900s, surnames were a free for all. Like the name Smith? It's yours for the taking. Learn the answer to the question: Why did a family named Shochet become Shoer? Do you have a question you would like to see answered on the Reconnecting Relatives Jewish genealogy blog? Comment below or on the blog or email Jennifer. The most commented post on The Scrappy Genealogist is the one in which I write about traveling back to the place I first lived, Butzbach, Germany. My Dad was stationed there from 1965 through 1968. We lived on Texas Road in the American military housing complex, Roman Way. My memories of our time there are hazy, but when we visited, I felt a deep connection to the place where I spent my first years. Memories can be intellectual, but mine of Butzbach are physical and emotional. Photos by Stimpyrama: This site's photographer takes beautiful photos of Lost Places. His photos of Roman Way are edited to create a gritty, emotional effect. and one of Schloss Kaserne. 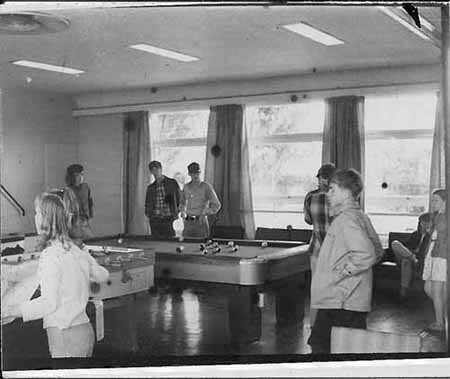 Frankfurt American High School has two interior photos taken in Butzbach, one of pool tables and the other of a snack bar. Flickr user Setjet posted pictures taken in 2003 of Roman Way and surrounding US Army areas. This blog Forgotten Memories has more pictures of the neighborhood. This is a series of pictures of Schloss Kaserne. We visited Schloss Kaserne during our visit. My Dad worked in this building during his service in the 1960s. I know that some of the buildings were torn down, but this one was still there. DearMYRTLE sent me a message with some exciting news to add to the already exciting news I shared in Prepare to Be Ambushed at NERGC. She is bringing prizes; an audio headset, an HD video webcam and a Samsung Galaxy 7" tablet! As if you needed one more good reason to spend three days taking genealogy classes and hanging out with genealogy friends. Hope to see you next week in Providence! Prepare to be Ambushed at NERGC! Who pops into your head when you combine the words selfless giving with genealogy education? I think of Pat Richley-Erickson, also known as DearMYRTLE. DearMYRTLE is a force in the Google+ Hangout on Air world where she hosts many different series all with the same goal, to help us. In DearMYRTLE's Genealogy Community, she takes advantage of the latest genealogy developments and creates cutting edge educational programing designed to help all types of genealogists learn the newest techniques for furthering their research. 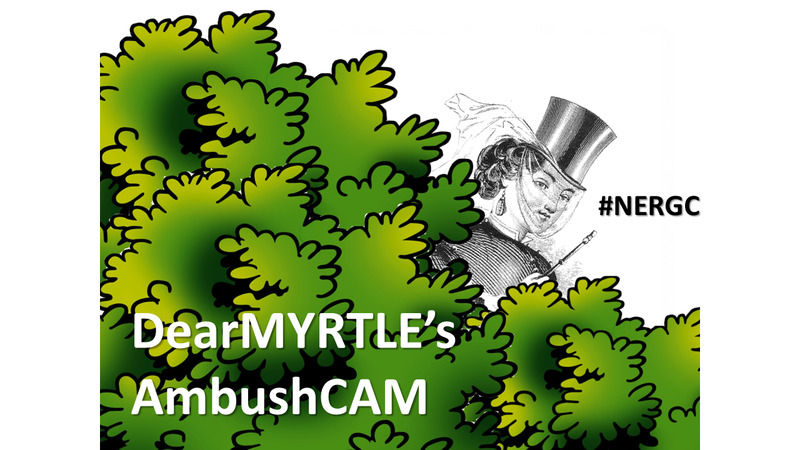 DearMyrtle is well known for attending conferences with her AmbushCAM. Pat, along with her famous Cousin Russ, will be at the 13th genealogical conference presented by the New England Regional Genealogical Consortium in Providence, Rhode Island at the Rhode Island Convention Center. Pat and Cousin Russ will use the AmbushCAM to interview attendees and vendors about the experience. Message from DearMYRTLE: "We want to show how *easy* it is to record even short interviews using a camera. Those videos are automatically archived on YouTube if you do this using Google's free Hangouts on Air. This is a GREAT idea for family reunions." DearMYRTLE and I at SLIG 2012. I agree and can't wait to see this duo in action in person. Meanwhile, check out the DearMYRTLE YouTube channel. Ok, conference goers, prepare to be ambushed! An Interview with Dr. Blaine Bettinger, "Praying for Spit"
The 13th genealogical conference presented by the New England Regional Genealogical Consortium is being held Wednesday through Saturday, 15-18 April, 2015 in Providence, Rhode Island at the Rhode Island Convention Center. National and local speakers will present lectures to family history initiates, dabblers, hobbyists, obsessives and professionals. All levels are invited and encouraged to attend. 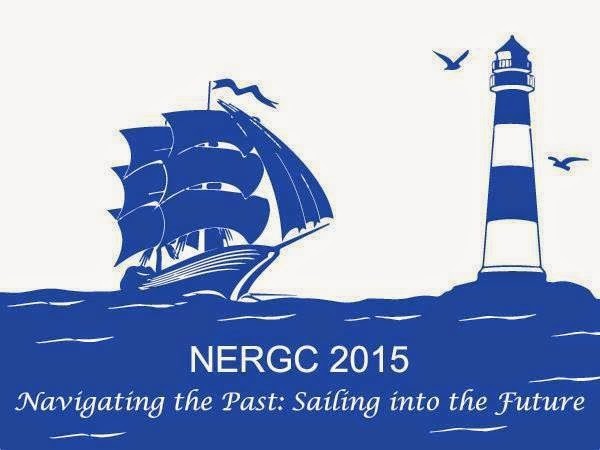 To peak your interest in attending NERGC, several bloggers were invited to interview speakers. I picked the long tube and got Dr. Blaine Bettinger! In this interview you will learn what DNA tests Blaine recommends, whether or not he has DNA evidence of Native American ancestry and his opinion on whether we can expect privacy when testing our DNA. To read the interview, head over to my website, Reconnecting Relatives. 2015 has been so full of genealogy, I have started to dream in generations. Really. Many a night I am talking with my ancestors. It's usually happy. I only feel sad when I wake up and realize that oh, it was only a dream. Or was it? I have been diligently writing during the first few months of the year. 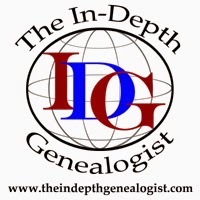 I continue to write the Ephemeral heritage column for Going In-Depth, a monthly digital magazine from The In-Depth Genealogist. In January, I wrote about Becky Higgins' super popular mobile scrapbooking app, ProjectLife. In February, I wrote about a cool new company, WeMontage. They make quality wallpaper photo collages. You can read my interview of the founder of WeMontage here. You can also read my interview with Valerie Elkins, a story teller and story saver. My business website, Reconnecting Relatives, LLC, sports several new blog posts about Jewish Genealogy as well as a post about a source for finding Revolutionary War soldiers in New Hampshire. If there is a Jewish or New Hampshire genealogy research topic you would like me to cover, email me and tell me how I can help you. March is a big month. 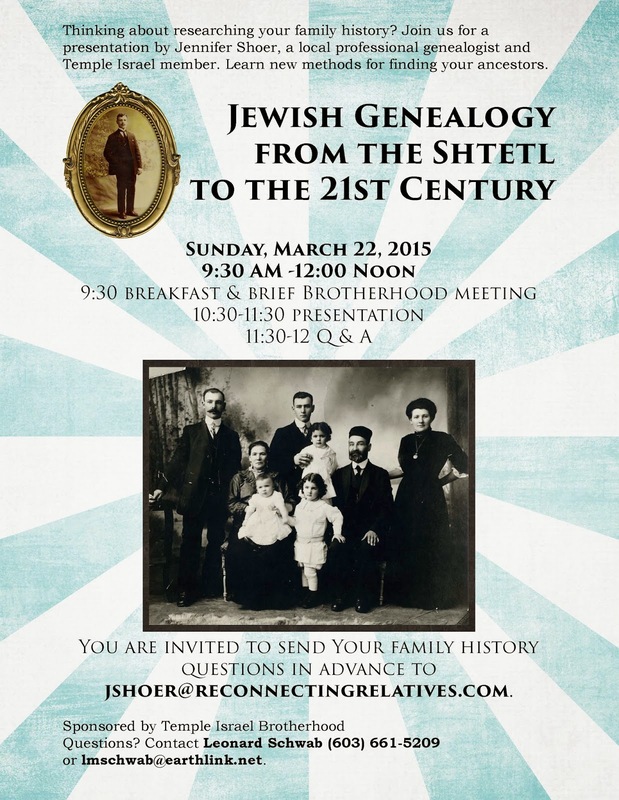 I will be presenting my Jewish genealogy talk, From the Shtetl to the Twenty-First Century. I am excited to share modern and traditional methods unique to finding our Jewish ancestors. If you are in the neighborhood join us for the presentation at Temple Israel, Portsmouth, NH. Temple Israel was the first permanent Jewish house of worship in New Hampshire and has existed in its current home for over 102 years. Here's to moving forward in 2015! Research on! What a busy month and it is only half way through. On January 1st, I left with my middle daughter to drive to Florida where she will be living for a few months. 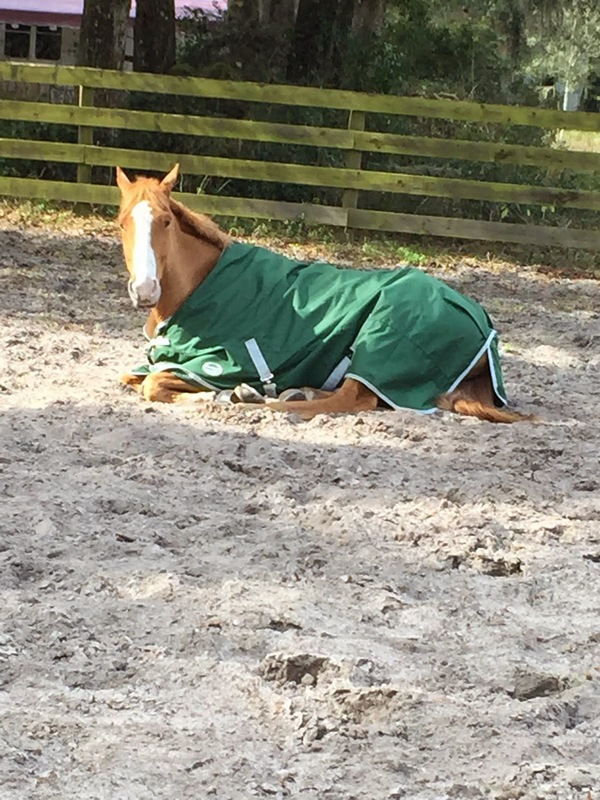 She is working with horses and training her horse for cross country eventing and jumping. 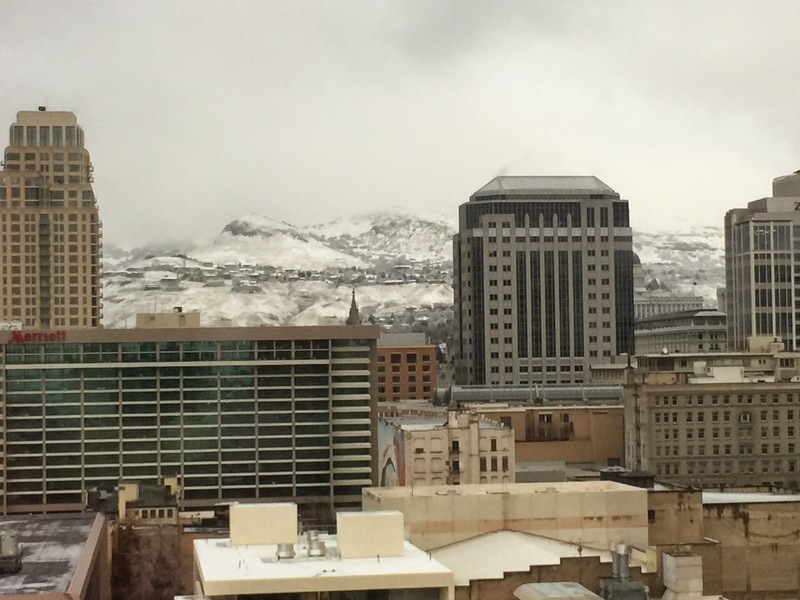 From Florida, I flew home for one day, unpacked and repacked my suitcase and flew to Salt Lake City for the Association ofProfessional Genealogists' Professional Management Conference. This conference is for professional, hoping to be professional AND serious nonprofessional genealogists. 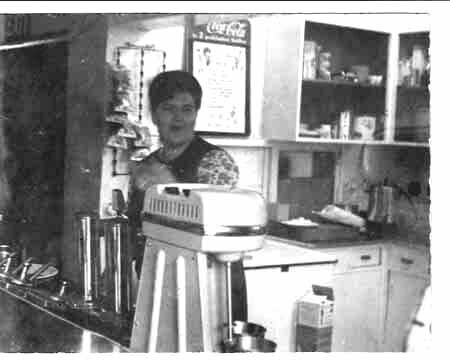 Presenters were national level and included well known names; CeCe Moore, Judy Russell, Tom Jones and more. In 2016, this event will be held September 22-24 in Fort Wayne, Indiana. As you know, Fort Wayne is home of the Allen County Public Library, which holds a tremendous genealogy collection. I started writing over at The In-Depth Genealogist. The first blog post about my new column, Ephemeral Heritage, appeared last week. The column, which shares ways to display your heritage, debuted today in the digital magazine, Going In-Depth. I have been home for a couple of days. Between reclaiming the house from the dust bunnies, grocery shopping and cooking, I have been catching up on personal genealogy emails. Genetic genealogy is starting to catch on and several family members and friends are testing and asking questions. How cool is that? Here's to a productive 2015! Research on!